Much is being made about Steve Spurrier stepping down from the head coaching position during the middle of the season and arguably the most critical point of the year. Most call him a quitter and that he is a coward for giving up, while others are saying that he simply isn’t cut out for the job anymore. I simply say that my Head Ball Coach doesn’t owe anyone anything and has more than lived up to his name while coaching the University of South Carolina Football Team. He came in and changed a team that was one of the laughing stocks of football into a national contender for a lot of his years and I’m happy with the level he brought the University to with what he had to work with. For that I can honestly say thank you Steve Spurrier, you mean a lot not only to our university but also to our state. When we had our ups, they were high up there, when we had our lows, they were the lowest you could get. I had no problem being a loyal fan all of my life and I have no problem saying that it was time for a change. 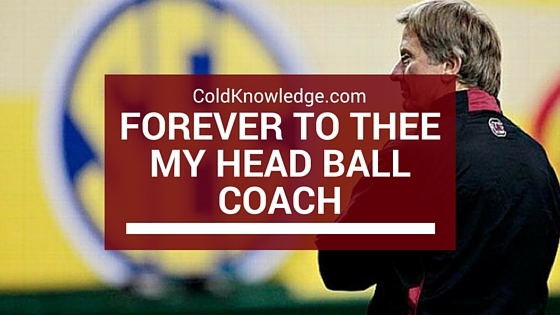 Coach did all he could do in this climate where most from his era would have been called it quits. Players old and new will always hold the Head Ball Coach to the highest of standards because while they played for him he held them to the same set of standards. When I was away from home for a couple of years he delivered some very big wins to boost my moral. Whether it was beating then #1 Alabama in 2010, Urban's Gators in 2005, a #5 UGA in 2012, that amazing OT victory against Mizzou in 2013, or the 5 year stretch of trashing Clemson, he delivered the best he could. "We had a big win over that team from the Upstate recently. It was a very close game. Went into the fourth quarter. Our defense very well -- offense. Our kicker made his kicks. And we were able to beat Wofford 24-7 at Williams-Brice. Big win ... But they didn't give us a trophy for beating Wofford. We had to beat that other team from the Upstate." That was some of the best times that I watched football, because not only did our coach, he was a leader off the field. As I said before, a lot of people say that he quit on the team in the middle of the season, no he simply walked away and left the team in great hands. If never been to USC and seen him walking around campus and how much he's adored by not only the school but by the state at large, then you don't know anything about college football. The fac that he left on his own accord and gave the kids a fighting chance to make something out of this season, well that took more courage from him than anyone could imagine. At the end of the day, regardless of what anyone says to me about him, he is my Head Ball Coach, and he did a hell of a job with the team that I love the most. I will surely miss him on the side line cussing up a storm and flipping off his headset anytime someone messed up and him being right there any time someone did something right.